The 2016 Internazionali BNL d’Italia final will be an-all American affair between the world number one, Serena Williams and the unseeded, Madison Keys. Keys saved her best win of the week for the semi-finals, defeating Muguruza for the third top five win of her career. In a rain-interrupted first set, Keys always looked the better player. Muguruza returned particularly well with consistent depth, but she was patchy on serve producing some untimely double faults towards the end of the first set. Muguruza hit back-to-back double faults serving at *5-6, but managed to force the tiebreak. However, she double faulted twice more to go down 2-5. Muguruza got both mini-breaks back but then made the wrong decision in control of a point (easy to say from my viewing position!) with Keys roaring into life with a fantastic backhand passing shot winner. 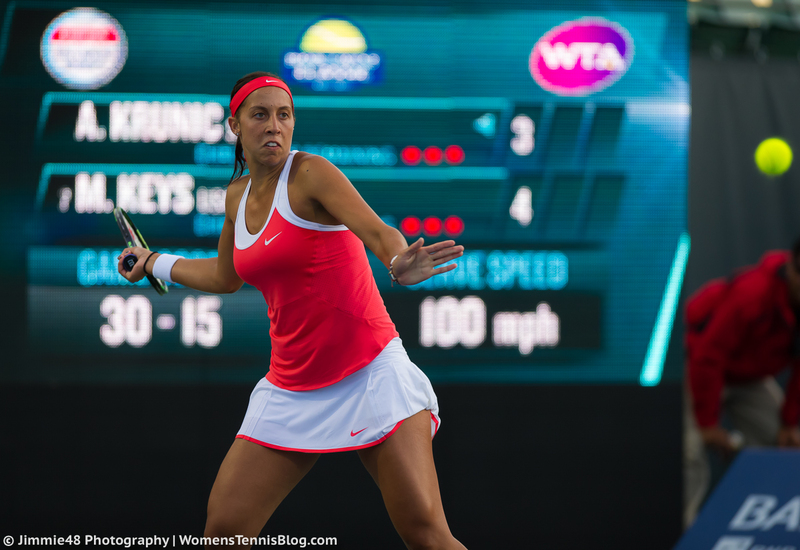 Keys converted the set on another winner off the backhand side, a superb down-the-line stroke. As Keys became more secure with her groundstrokes, Muguruza’s error count began to rise and rise. The second set went with serve for a time, but another double fault (Muguruza finished with eight for the match) and an unforced error gifted Keys the lucrative break of serve. A brief rain shower with Keys serving for the match at *5-4 *30-15 threatened to make life interesting and then Muguruza had two lucky net cords on the first match point. Keys though sealed the win on the second match point to book her place in the biggest final of her career so far. Serena’s had a good week and this is JUST what she needed heading into Roland Garros. The world number one hadn’t played since Miami and has yet to drop a set this week, coming closest to that feat in the third round where saved a set point in the first set of her match against Christina McHale. For a time, Begu was competing well in their semi-final match with six of the first seven games going to deuce. Serena was not as sharp as she was in her dominant victory over Kuznetsova on Friday night, but Begu showed some of the form that has seen her win 13 matches at her last five tournaments. Begu won two games in a row to get back on level terms at 4-4, but won just two points in the next two games; Serena won the first set, 6-4. The American was more destructive on return and while Begu played some decent tennis, she needed to take her game to the next level. She didn’t quite have the weaponry on this occasion to push Serena anymore. Serena won the last six games of the match to reach her third final of the year. I loved the handshake where you could hear Irina say to Serena “it was a pleasure”. Keys jokes: “Mostly excited that I'm not playing Angie in a final, finally.” 1-1 vs. AK in prior finals. Head-to-head record: Serena has won their two previous matches; both wins were in straight sets at the Australian Open (7-6(5) 6-2, 2015) and US Open (6-3 6-3, 2015). Interesting stat: Serena is 0-2 in WTA finals this year, losing out to Angelique Kerber at the Australian Open (4-6 6-3 4-6) and Victoria Azarenka at Indian Wells (4-6 4-6). Serena though is 3-0 in Rome finals, winning titles in 2002 (d. Justine Henin in the final, 7-6 6-4), 2013 (d. Victoria Azarenka in the final, 6-1 6-3) and 2014 (d. Sara Errani in the final, 6-3 6-0). Final thoughts: Keys will need to get a few games on the board early to settle but as the clear outsider, should hopefully not be under too much pressure to perform. She may have hope from the fact that Serena hasn’t been able to bring her A-game in the two finals she has played so far this year. The world number one has looked in decent form this week, producing her best display in a quarter-final victory over Kuznetsova. I have slight reservations about Serena and this is a big match for her as she seeks to win her first title since Cincinnati last year. A peaking Keys could upset the apple cart once more, but she’ll need to match the consistency she found against Muguruza on her backhand wing and then some. I’m going for Serena in two tight sets. May 14, 2016 in Keys, Rome, Serena, WTA. I feel like Serena has played this tournament with zero pressure. It’s not a tournament that really means anything big to her in the grand scheme of things, other than being a tuneup for the French Open, and this shows in her free swinging groundstrokes and booming serve. I’ve said since the start I don’t think she’s going to drop a set and I’m sticking to that here. My gueess is that Serena will win tomorrow. She beat Maddi in the US Open last year by attacking her second serve, which is weaker than her formidable first serve (she can serve at over 120 mph) and she could well try and do the same thing again tomorrow. It should be a good match though as both players like to hit with power, the rallies will most likely be short.